CarGurus has 1,048 nationwide Prius v listings starting at $5,695. Similar to its Toyota siblings the Prius C and Prius Plug-In Hybrid, the 5-passenger 2013 Prius V is in its second year of production and, also like the others, has had no significant changes from last year’s models, with the exception of a simulated-leather-trimmed steering wheel. 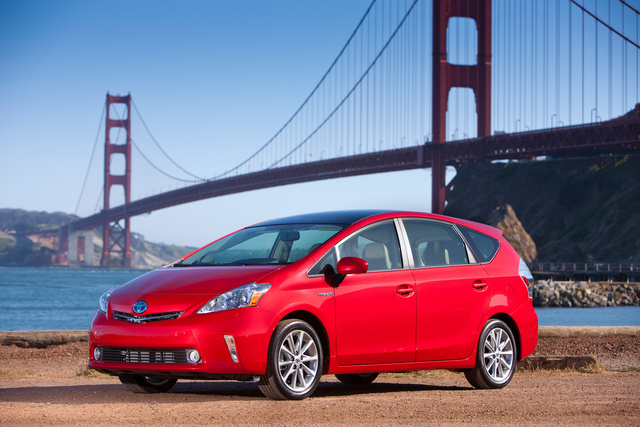 The 2013 Toyota Prius V is available in three front-wheel-drive trims: Two, Three and Five. All hybrid gasoline-electric Prius V trims roll off the assembly line equipped with 1.8-liter 2ZE-FXE inline 4-cylinder dual VVT-I engine that achieves 98 hp and 105 lb-ft of torque. Along with its 60-kilowatt traction motor, the Prius V makes 134 hp and 153 lb-ft of torque. The Prius V's engine is mated to an electronically controlled continuously variable transmission and a 201-volt nickel-metal hybrid battery pack and is estimated to get 40 mpg city/42 highway. All versions of the 2013 Toyota Prius V come standard with power windows, power door locks, heated power exterior mirrors, automatic climate control, cruise control, a tilt-and-telescopic steering column, simulated-leather-trimmed steering wheel with mounted audio controls, keyless entry, cloth seating surfaces, a 6-way adjustable driver’s bucket seat, 4-way adjustable front passenger bucket seat, 6.1-inch touchscreen display with integrated backup camera, a 6-speaker audio system with AM/FM radio and a CD player with WMA/MP3 playback capability, projector beam halogen headlights, LED taillights, a rear spoiler and 16-inch 10-spoke aluminum alloy wheels with all-season tires. The 2013 Prius V Three and Five trims come factory installed with an Entune audio system and navigation with a touchscreen. The Prius V Five trim comes equipped with simulated-leather-trimmed front seats, push-button start, LED headlights with auto-level control, integrated fog lights and 17-inch 10-spoke aluminum alloy wheels. A panoramic sunroof, dynamic radar cruise control, 7-inch touchscreen display with navigation and integrated backup camera, and an 8-speaker JBL audio system with AM/FM/HD radio and CD player with WMA/MP3 playback capability are available options for the Prius V Five. All 2013 Toyota Prius V trims are configured with numerous safety features and have been rated a Top Safety Pick by the Insurance Institute for Highway Safety. They include Toyota’s Star Safety System: enhanced vehicle stability control, traction control, antilock brakes, electronic brakeforce distribution, brake assist, hill-start assist and smart-stop technology. There are 7 airbags in the Prius V: driver's and front passenger airbags, driver’s knee airbag, and front and rear side-curtain airbags. The steering column is energy absorbing and collapsible, and the driver's and front passenger seats are designed to be whiplash lessening. An engine immobilizer and vehicle proximity warning system are standard security features, while Safety Connect, which features emergency assistance, a stolen vehicle locator, roadside assistance and automatic collision notification, is an upgrade available for the Prius V Five only. Many buyers of the 2013 Toyota Prius V chose it over the regular Prius for its larger size, exceptional fuel economy and spacious cargo area (67.3 cubic feet!). Prius V trims are not known for their handling, and that’s not why you'd buy one. 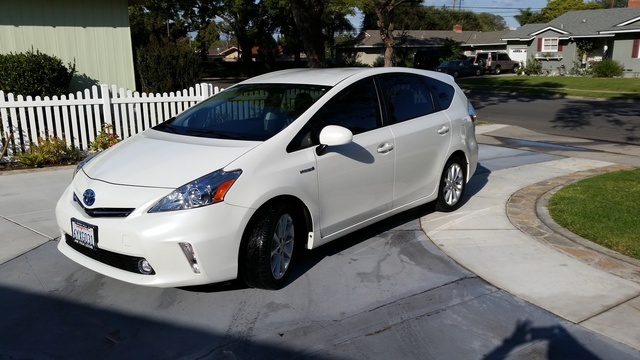 However, some current owners do note that the Prius V offers a quiet and smooth, if not particularly powerful, ride. The Prius V is a little heavier than its counterparts, so it feels relatively stable on curvy roads. For those looking for a wagon-style hybrid, the 2013 Toyota Prius V is your likely choice. Designed for families on the go who are both fuel conscious and looking for extra space, the Prius V generally outshines the Ford C-Max Hybrid, which is its closest competition. Pricey like most hybrids are, the potential savings the Prius V offers clearly outweigh its upfront costs. What's your take on the 2013 Toyota Prius v? Abby1k The monitor for the radio/phone/backup camera turned from having a black background to white then to unable to see it at all. Has anyone else had this problem? It cost over $1,500 to replace the whole thing. I think it’s a defect. Have you driven a 2013 Toyota Prius v? Does Power Seats Come Standard With The Prius V 5?